Hello and happy Monday! I can't believe it is March tomorrow, I can feel spring coming on and it makes me giddy! I seriously love how they turned out, and I am sad I didn't do this sooner! :) Lets see how these lights come to be. See these little lamps? I got them for a $1 each at a garage sale a few years ago and they have done well. The problem? They weren't exactly the look I was going for...and they took up too much space on my Floating Night Stands. 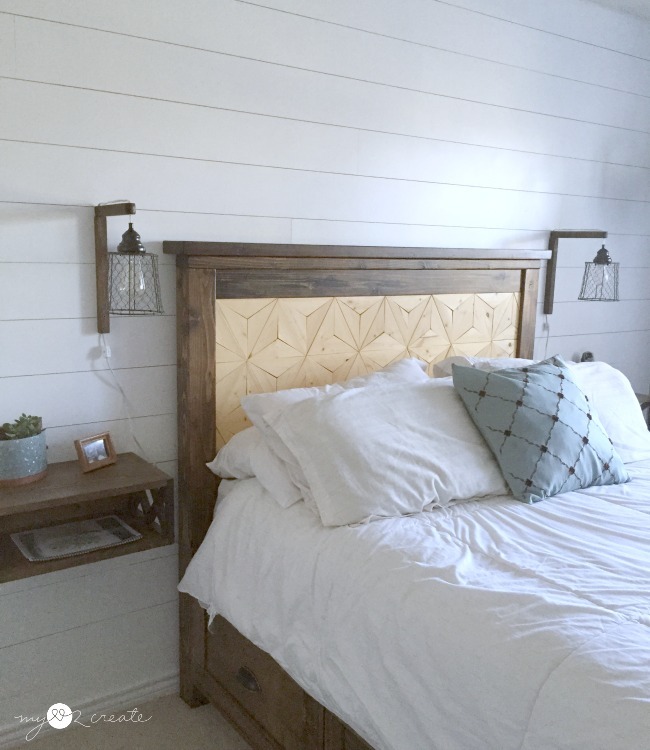 I had been wanting some bed side sconces ever since I finished my Plank wall and my Farmhouse Storage bed but I wasn't sure how to do it since I couldn't hardwire them to the wall. My next option was to use some type of plug in lights. I finally went to the store to get some things that I knew I would need. 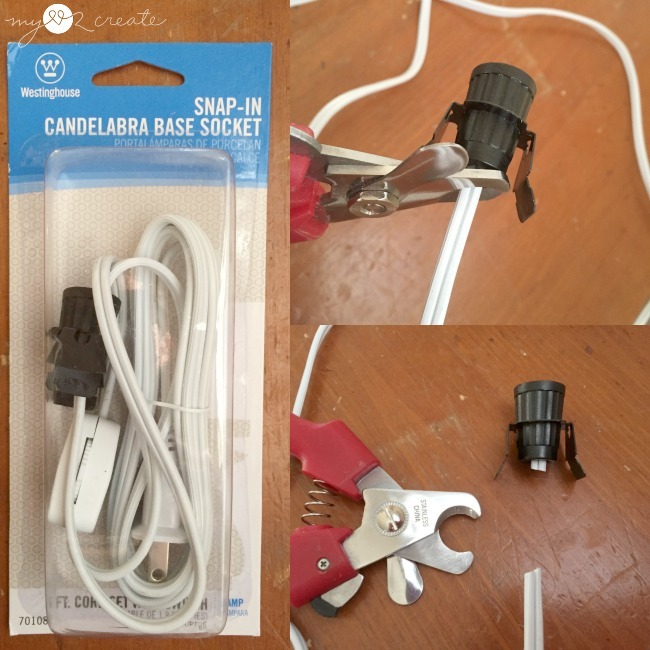 I decided that buying this cord would be the cheapest and fastest option to convert my pendant lights into plug in lights. It was only $6.27 at home depot, but I also found it cheaper at Amazon, so next time I will plan ahead. 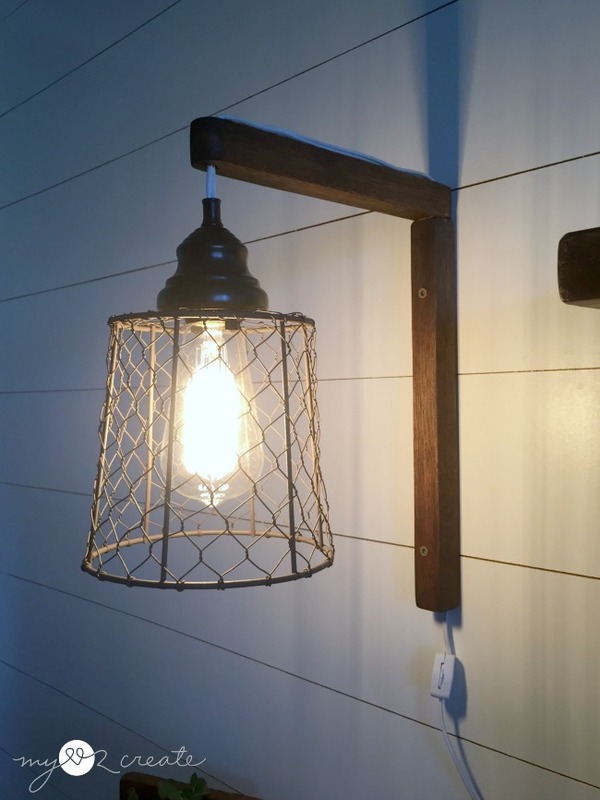 Or you can buy Pendant light cords for pretty cheap too! 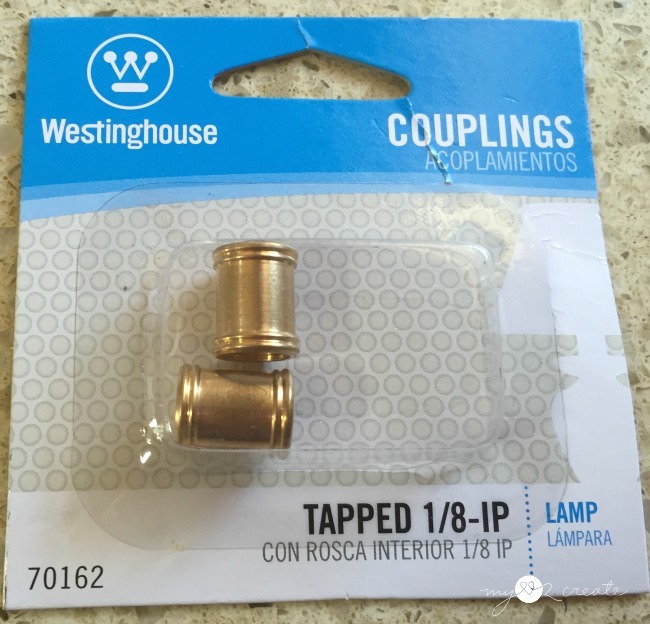 I also got some wire connectors and couplings (pictured above), and eventually I decided on a wire basket for the light shades, which I got at Walmart for less than $3 each, everything else I had on hand. 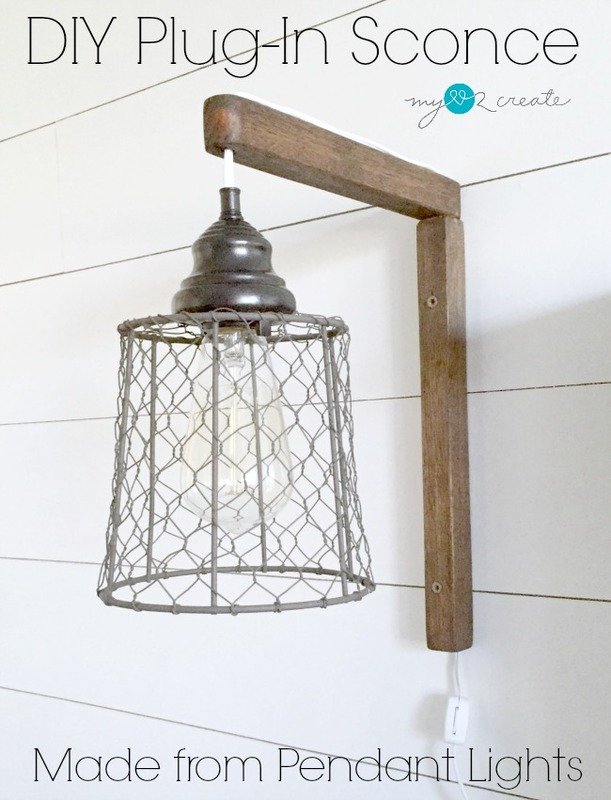 Which leaves me at just under $12 a sconce. Not bad! 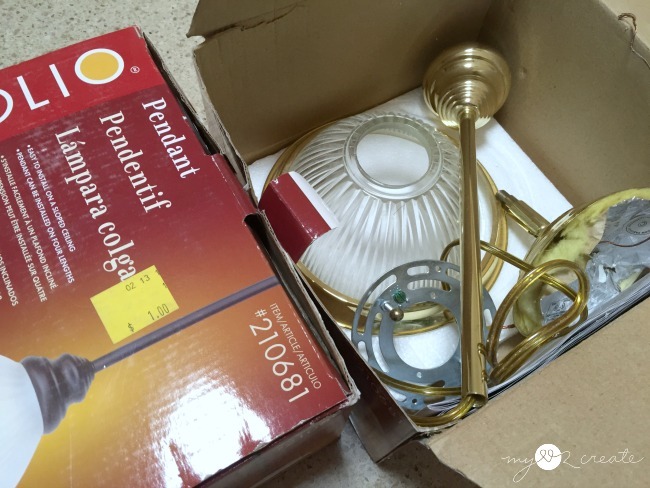 Now not all pendant lights are created equal, so you may have to do some adjusting. I will show you what I did with what I had. Please know I am NOT a licensed electriction, so keep that in mind. 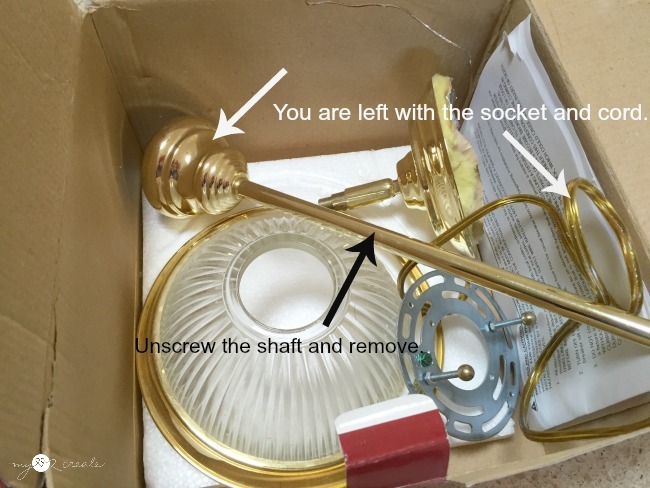 In the photo above I have white arrows pointing to the parts I used, the black arrow is pointing to the shaft (not sure the real term) which I debated using, and then decided not to use. I simply unscrewed and removed it. 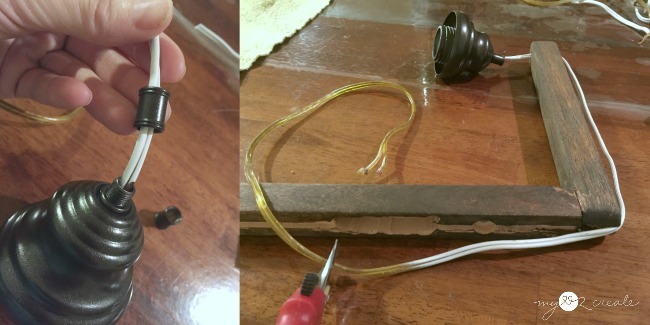 I also used a metal socket ring(not shown) that holds the glass light cover in place. 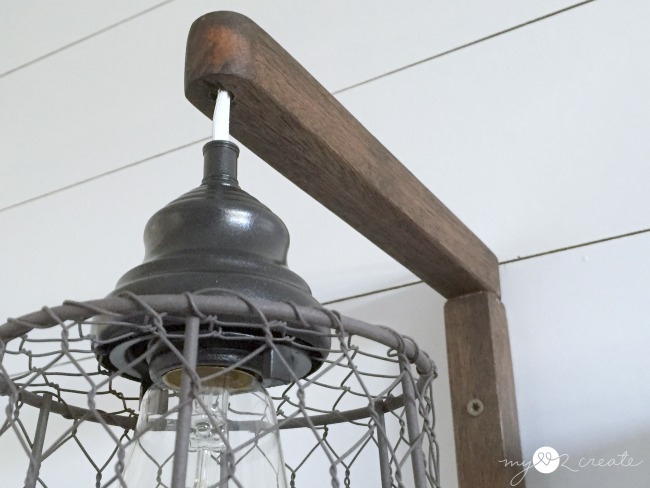 I took the pendant lights and spray painted them with oil rubbed bronze metallic spray paint, along with the two couplings, and the socket rings. For wood sconce I used this wood that came from an outdoor lounge chair. I used my jigsaw to cut off the 1x1 boards and then cut them to the size I wanted. 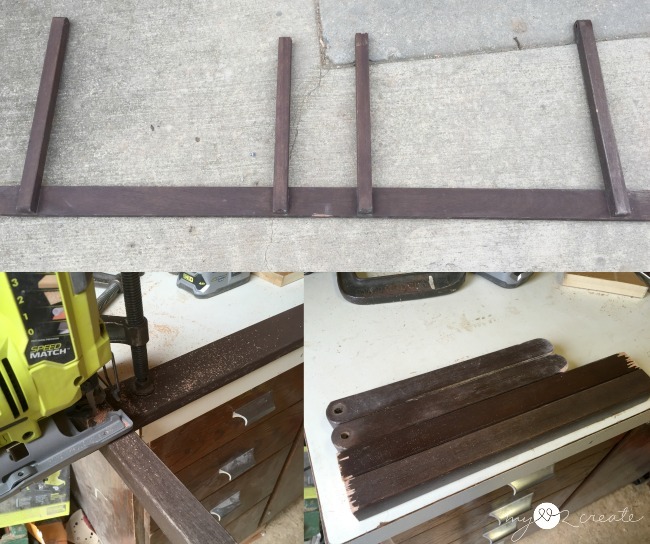 The long pieces are 12 1/2'' and the short ones are 10'', you can adjust to fit your needs. The short ones already had the rounded ends and even had a hole in it. I ended up drilling the hole a little bigger so my light cord could feed through it. This step is not necessary but I am going to show you anyway. 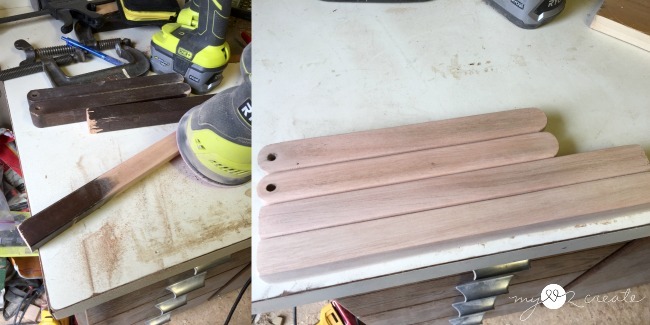 I rounded out the other ends of the short boards with a jigsaw. My original intent was so that I could add a bolt and make my light arm movable, but in the end I decided against it. So unless you want your lamp arm to swivel from side to side, just keep it square. Luckily this wood stain sands off pretty easily. I should know, I used wood from this outdoor chair on my Reclaimed Wood Media Console drawer fronts and spent a tons of time sanding them down. Just doing four pieces seemed like a piece of cake! Now here comes the not so pretty part...I have used a router on a table before but never free hand like this, and sorry to say it shows. :) But honestly, I knew this would be hidden, so I wasn't too concerned. 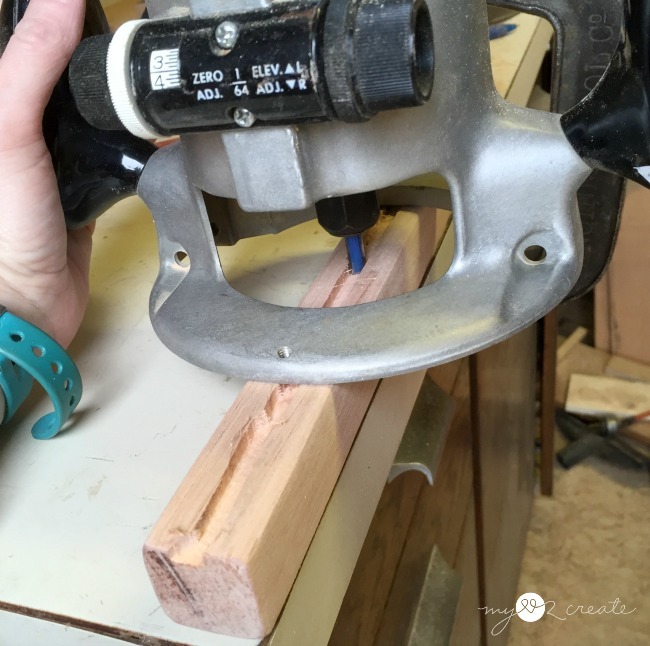 If you have a table saw then you could do a couple passes in the middle and create a channel for your cord, which is what I did with my router above. 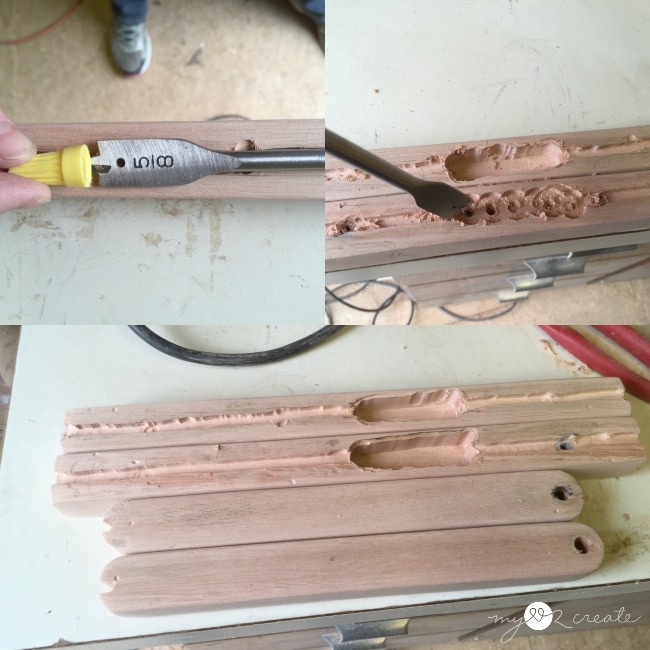 I knew that I would have to hide my wire connectors, in the back too and so I used a drill bit just bigger than the wire connector and started some holes in my wood. With this little area started I again used my router to clean it out. Again, not pretty, but I was winging it here folks, and you have to start somewhere right!? 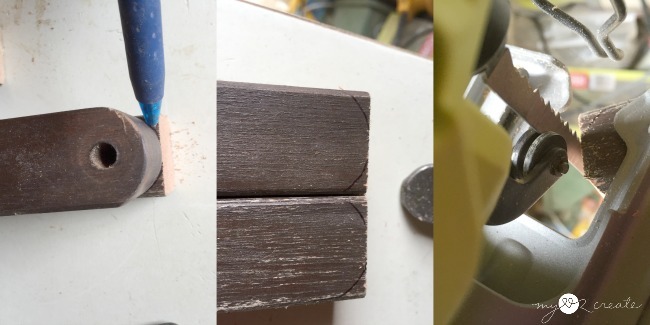 You may have noticed the little notched grooves in the previous shot, I used the width of my cord channel and marked the arm piece in the back. 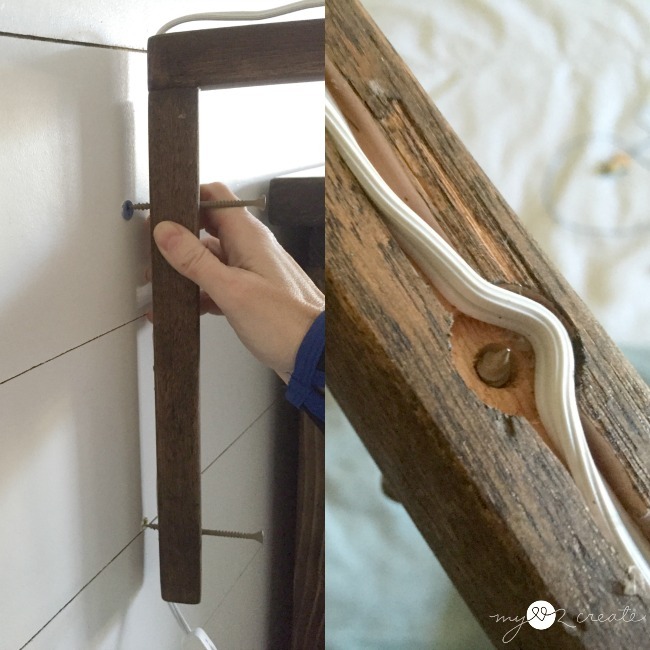 Then I notched it out with my jigsaw so that my cord could go down the back and my wood pieces could still be flush to the wall. Building time, ha ha! Ok it is a VERY small build. :) I attached the arm to the back piece with wood glue and some 2'' nails to secure it. Then, leaving space in the middle, I pre-drilled and added a 2'' screw. 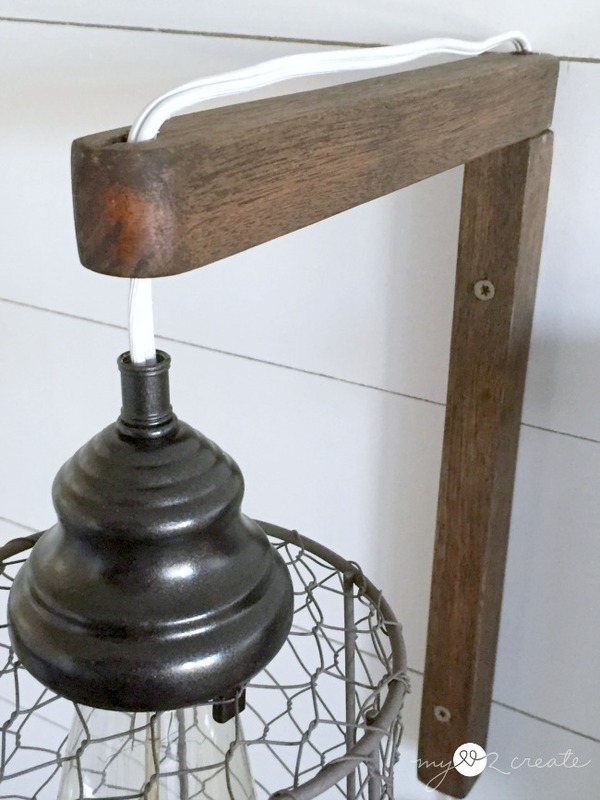 After staining my wood (Minwax Jacobean) and painting the pendant light cord white, to match the cord I bought, I was ready to do my wiring! I added the coupling to the top of the light to give it a finished look (left) and and secure it, then I threaded the cord through the hole on the end of the arm. In the photo on the right you can see I am cutting the cord right at the bottom of the notched out area where my wire connectors will go. Now to put the cords together. Since they are plug cords it is pretty simple. I split the ends of each cord, so I had two separate wires on each cord (top left). Then I used my wire cutter/stripper to strip about 1/2'' off of each side. This exposed the copper wires on all four cords (top right). In the bottom left photo I took wires from each cord and connected them to the wires on the other cord, buy twisting the copper wires together. Then (bottom right) I put on the wire connector and twisted clockwise until it was tight. Once both connecters were on I put some electrical tape around each of them to make sure they were secure. Then I plugged in the cord (DO NOT HAVE IT PLUGGED IN WHILE YOU ARE JOINING THE WIRES, obviously), and it worked!! Woo hoo!! Seriously easy. 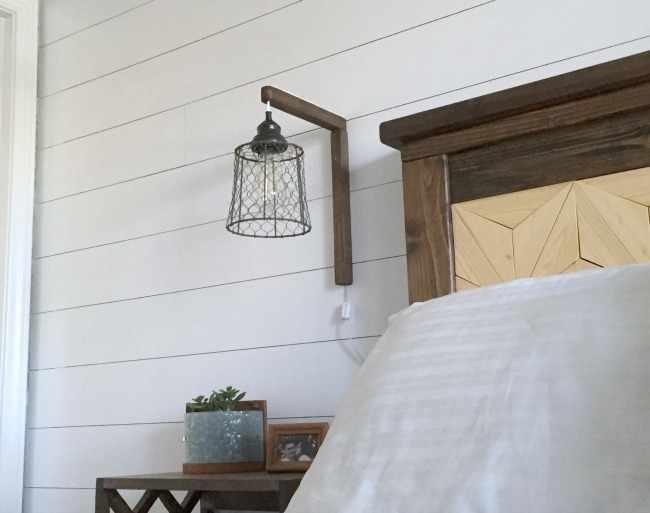 At some point I realized that my plan to secure the light to the wall with screws through the middle of the wood wasn't going to work if the cord was in the way. Nice. 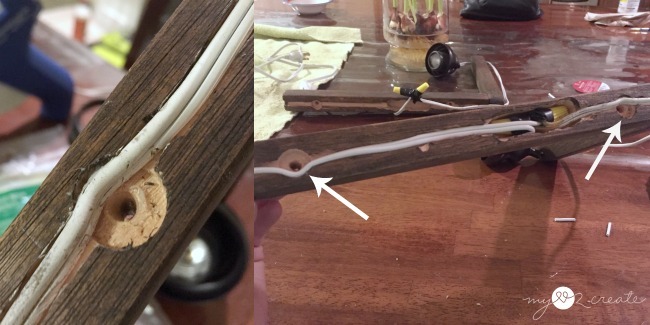 So I fixed my oversight by drilling a hole as deep as my cord channel, then I hot glued the cord around the hole where the screw would be coming through the wood. Phew! 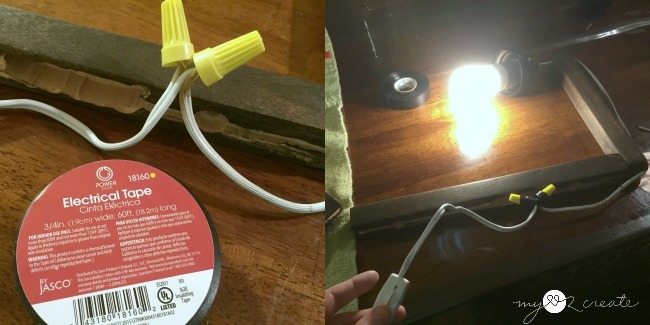 I did ask the electrician at Home Depot about this and he thought hot gluing was a great solution. So I did it. And it worked great! Can you see my two wire connectors all snuggled inside their little home? I was seriously glad it worked at this point since I am super newbie to lighting projects. Next up was my wire light cage. 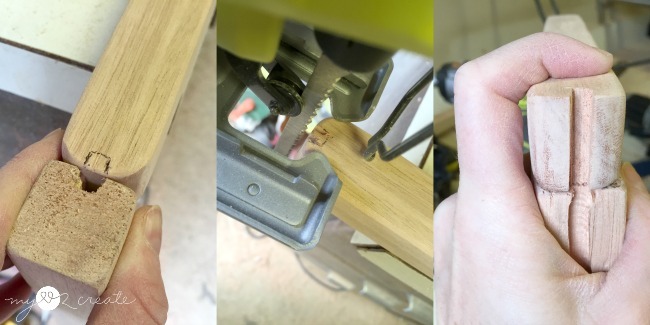 I seriously debated back and forth on how to do these and even spent half a day cutting wooden bowls in half with a hack saw...yeah, story for another day and hopefully I can turn it into another project...eventually. ANYway, after I dropped my son off at work on Saturday I desperately ran into Walmart to see if I could find something, ANYTHING that might work. I spotted these cuties in the craft section and snatched them up, they were the perfect size! When I got them home I thought I would have to cut off the handles...as turns out, they popped off pretty easily with a little muscle. I used the socket ring as my guide to cut a hole in the bottom of the basket with a wire cutter. 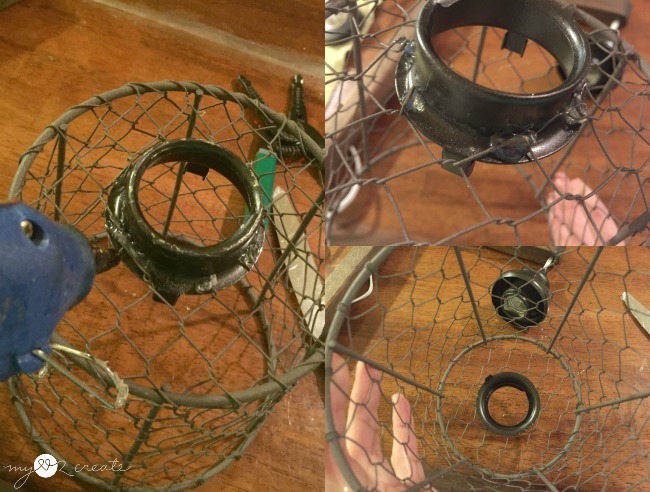 With some more hot glue magic I was able to attach the bottom of the basket to the socket ring, and it was ready be attached to the light. That is it! I can't believe it took me so long to do this! Don't they look cute?! And that switch is easy to reach for turing my new light off and on. I only had one cool light bulb so you will see some shots with regular ones as well. I wasn't going to run to the store at this point...it can wait. 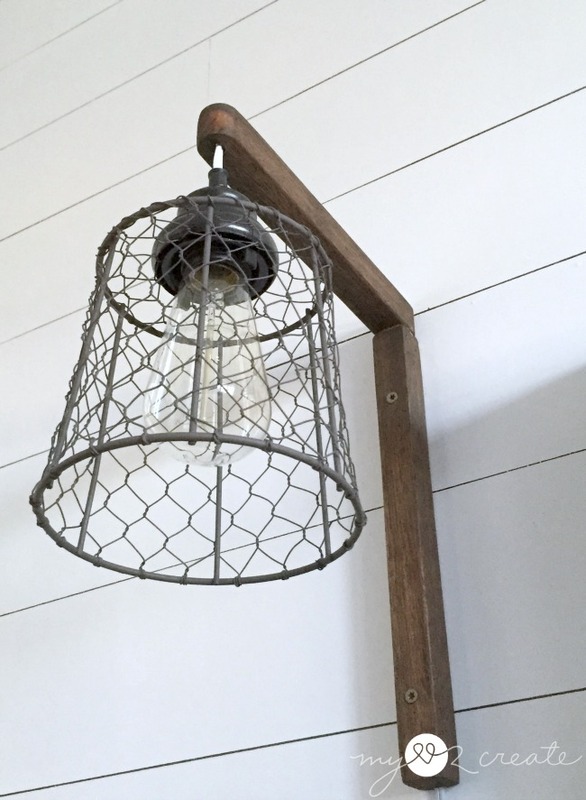 I love the way this edison bulb looks, so it will be nice when I have a matching pair! I am so glad I found these baskets and that they worked so well. I liked the color, and decided not to spray paint them to match the oil rubbed bronze. Maybe I was wrong, but I thing it gives it more dimension. It is so fun to have them hanging by my bed! ...and now it doesn't seem so lonely in the corner with my planter and new light! The cord on the top is hardly noticeable, and I actually like it exposed, but I guess if you had mad router skills, unlike my drunken sailor router skills, you could make a channel for your cord on the top too. Here is a shot from below, so hopefully you can see how nicely the socket ring ties the basket to the pendant light, it is seamless. Kind of makes me happy! Thank you SO much for sharing and pinning! 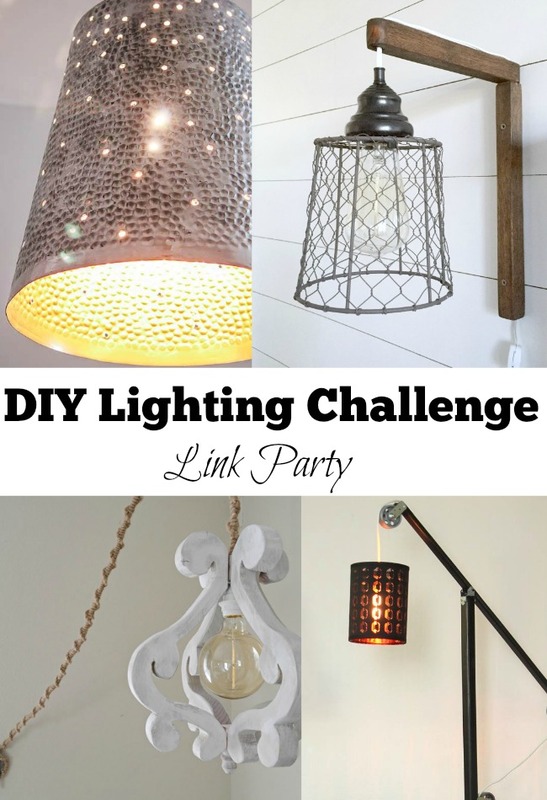 Now, are you ready for some more amazing DIY Lighting Challenge projects?! I am! And Guess what? We want you to participate too! So PLEASE link up your own DIY light projects and let your friends know so they can join in the fun too! Yup, I pinned it, it gives me all sorts of ideas. 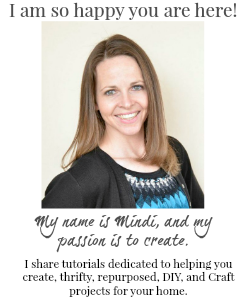 Awesome to see how you make it work, Mindi! 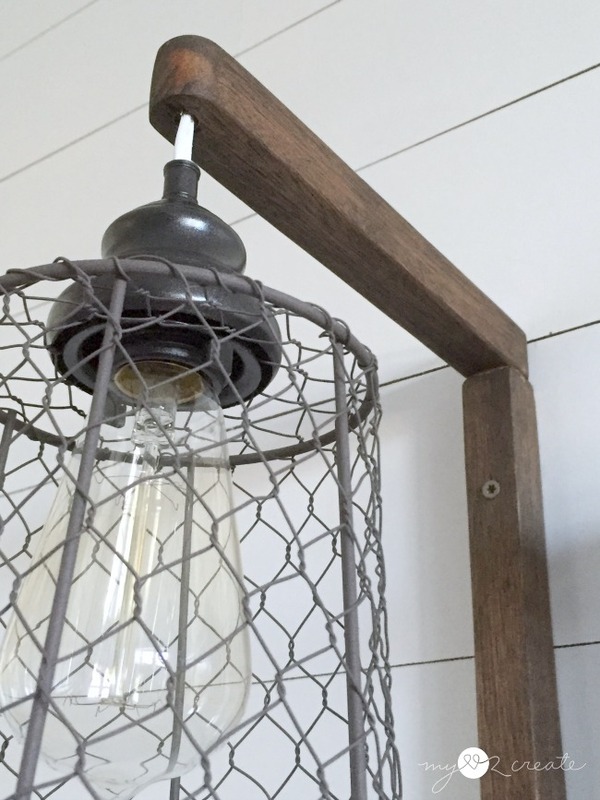 I love the new shades rustic, industrial look! Mindi, I love these! Thanks so much for sharing your tutorial. What a cool project - love how they came out. Wow, those are so cool! 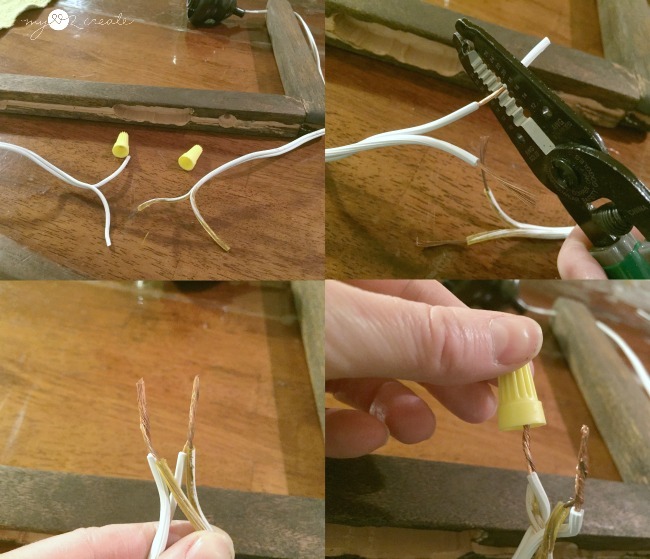 DIY electrical is one thing I'm always a little scared of doing myself, but you made it look easy! Love this so much, shared on Facebook! Thanks for linking up to Talk of the Town Link Party. Oh my! I think your lights are beyond amazing. Love them! Great lights! They totally mesh with the look you've created with your bedroom. Visiting from The Creative Exchange. Lots of creative lighting. Love them! Pinning! This is such a great project! I am so inspired by your electrical skills! These turned out amazing! What inspiration, and they really elevate the look of your room. 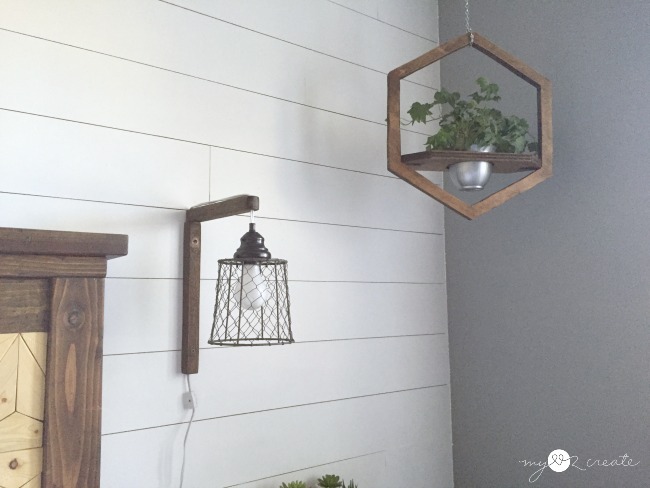 I love the hanging planter btw, did you make that as well? OK, I LOVE these! They look perfect hanging by your bed! 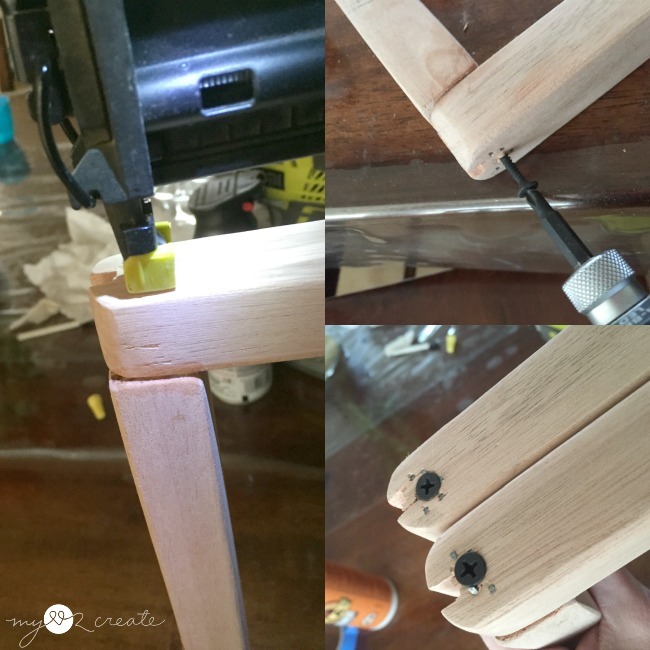 Thanks for sharing this awesome project at Totally Terrific Tuesday Link Party. 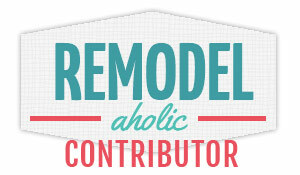 You never disappoint us with your cool projects! Enjoy your weekend. Hi, Mindi! Omigosh, I love them! 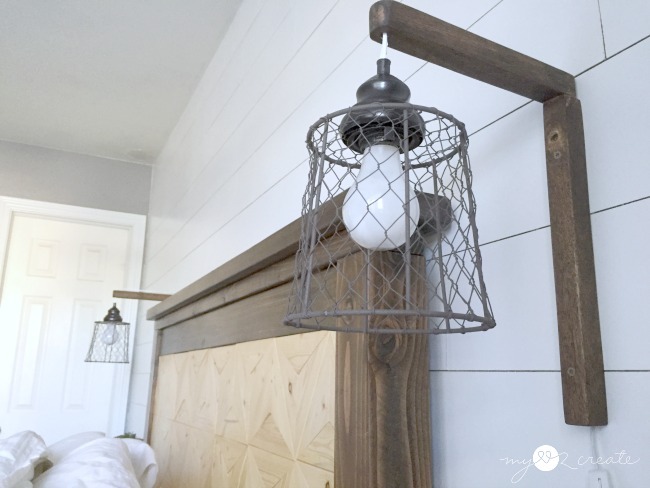 The rustic cage and wooden bracket just look so perfect in the room. Awesome! 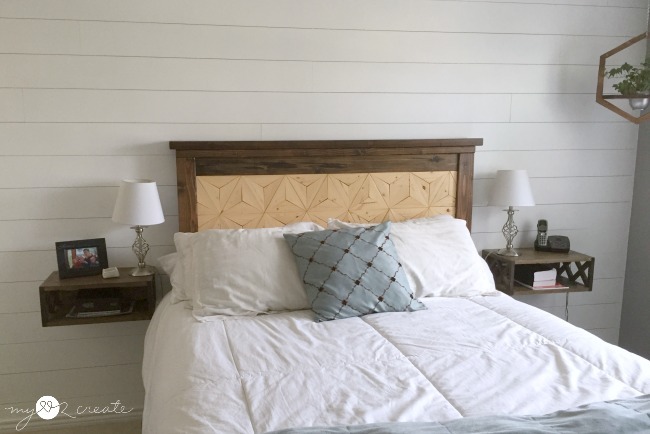 I love the way the look next to the bed! Your lights are amazing!! Love how they turned out :) Thanks for linking up with Merry Monday! What a difference those lights make. 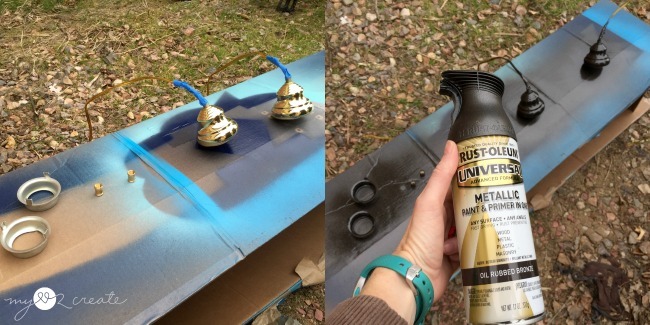 You amaze me with your DIY skills. You amaze me with your skills! 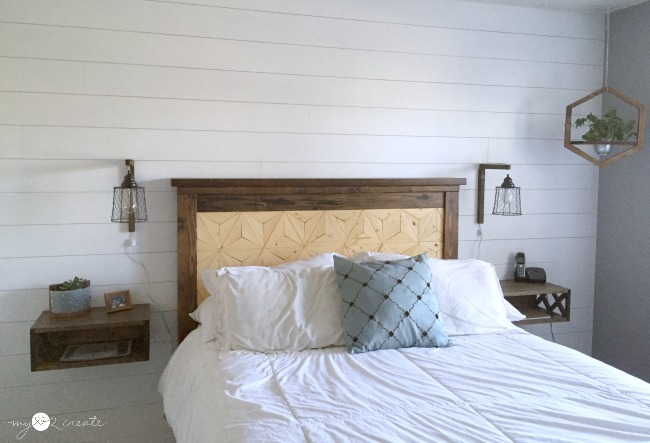 Love, love the light and I'm drooling over your planked wall. Want to do that so badly! Thanks for sharing with SYC. What a fabulous idea!! They look so awesome!!! LOVE love love! 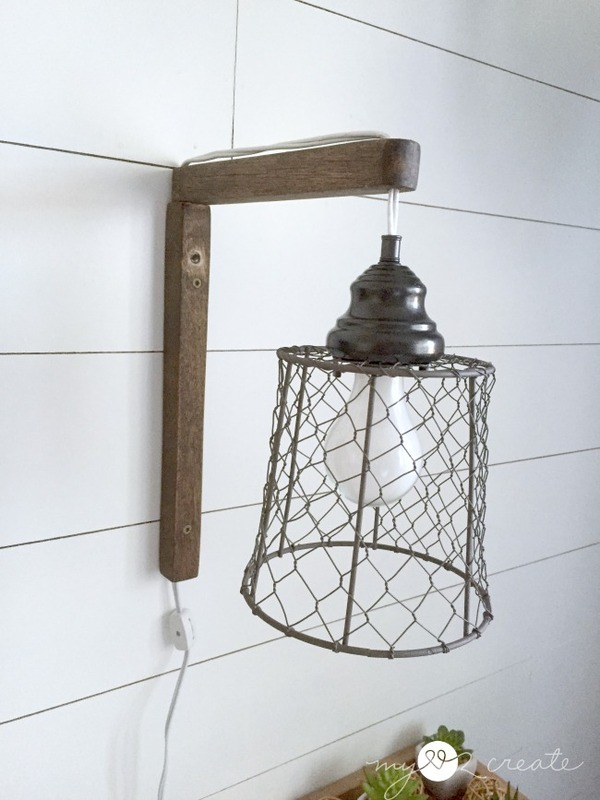 I love your new sconces! You're bedroom is really coming together. You should be just about finished, right?